2019 Gifted Institute camp is filled! Apply Now to be on the wait-list. In a change from previous years, registration and class selection will be processed separately. Class selection will open April 8, 2019 to all accepted campers. More information will be coming soon! 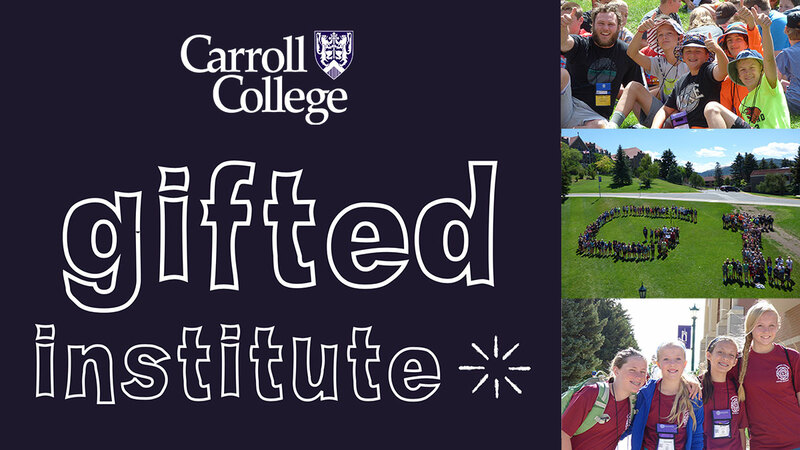 Founded in 1984, the Carroll College Summer Gifted Institute is a one-week residential program that serves a diverse range of gifted fifth through ninth grade students. The classes and activities with adults and peers will enhance students’ cognitive and social development. Gifted students entering fifth grade through ninth grade are eligible to apply. Each applicant must complete online registration. If you are new to the Gifted Institute, you are required to provide two online recommendation forms completed by school personnel. Previous Institute participants need not obtain recommendations. This online link can be sent to teachers you have requested to complete the recommendation. All recommendations are due by June 1st to complete your registration. A link to this form will be posted soon. A $50 non-refundable application fee is required with your registration which opens March 1st at noon. Enrollment is limited, so please complete your application materials as early as possible. Class selection opens on April 8th. A $300 tuition deposit is required at the time of class selection. The $300 deposit is refundable through June 1st. The full cost for the camp is $595. Payment in full is due before July 1st. Because the benefits of the Institute rely heavily on the interaction of campers with peers and supervisors, the campers are required to stay in Guadalupe Hall, which is located on Carroll's Campus. The campers will be chaperoned by qualified college students and adults. Campers will need to provide their own bedding and towels. Detailed lists of other necessary materials will be sent to each applicant. Breakfast, lunch, and dinner will be served by Sodexho in the Carroll College Campus Center. How is the Carroll College Summer Gifted Institute Structured? Campers select four courses from a wide variety of offerings. Classes meet Monday-Friday. Each course is divided into five 90-minute periods. Afternoon and Evening activities are included each day, which may include outdoor games, team-building exercises, relaxation, and creative games. Each camper is responsible for transportation to and from the Gifted Institute. Transportation for field trips will be provided by a professional charter bus company. Limited tuition assistance may be available to those who demonstrate a financial need (based upon the federal government’s free hot lunch income guidelines). The information you provide for limited tuition assistance will be treated confidentially and will be used only for eligibility determination and verification of data. Contact Allison Sever at asever@carroll.edu for more information. Contact Allison Sever at asever@carroll.edu for questions or more information.